Star Trek: Discovery delivers a riff on an old Star Trek plot when a mysterious life form threatens the ship and the crew have to race against time to save themselves. So many episodes of the various Star Trek shows have had this basic setup whether it be an anomaly of the week, a life form of some kind or a mixture of the two. In many cases these sorts of episodes were an easy way to justify a lower budget “bottle episode” where the existing cast and sets could be used to create a story. The best examples of these make good use of the claustrophobia associated with the ship the crew calls home turning into a death trap or house of horrors for a while. Discovery get a lot of stick for not being “real” Star Trek and I can understand those criticisms to an extent even if I don’t agree with them. I would perhaps modify the statement to it not being old school Star Trek because it’s difficult to quantify what makes any version of an established franchise more “real” than the others. If people find it difficult to accept the spin on the material that this show has then I can completely understand that. The point I’m making is that this episode is a great example of a different spin on something familiar. The strength of Discovery has always been in how it uses the characters it has. Michael Burnham is the central character so the show largely revolves around her but her core relationships are also important so the majority of the plots even if they are episodic will feed into her world in some way. 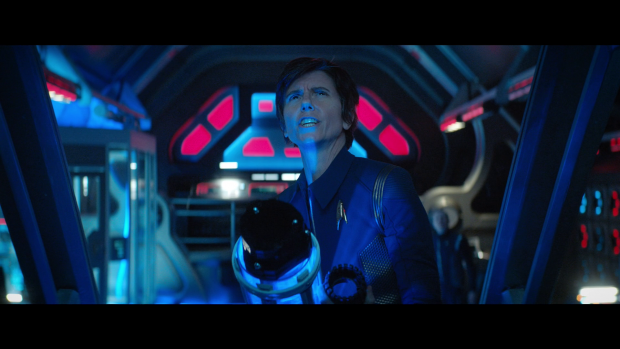 For example the encounter with the strange life form happens during the Discovery’s search for Spock -not sorry- which connects to Burnham for obvious reasons but also has significance for Pike who feels that he owes it to his officer to be the one to find him and bring him in. 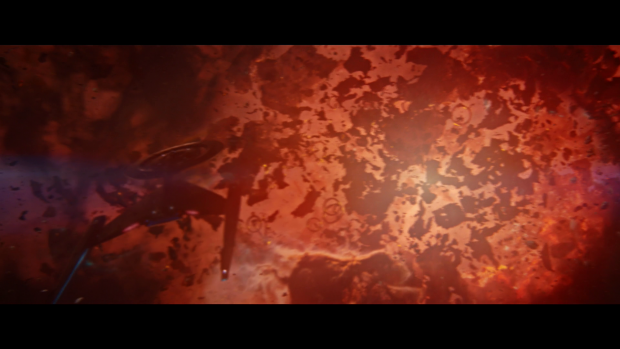 For the purposes of this episode’s plot Spock is little more than a tertiary ticking clock with the primary one being escaping the clutches of the life form before the ship is destroyed. There is also a secondary timer associated with Saru’s terminal condition but I’ll come back to that. On a character level the idea that catching up with Spock is imminent is very meaningful for Burnham who decides that she will stay out of his way when he comes aboard because she feels that the friction n between them will only make the situation worse. Her arc for the episode leads to her changing her mind on this and commit to repairing that relationship. It’s a solid arc as her starring point is clear and the experiences that form her change of heart are really well explored. I’ll come back to this in my discussion of the other plots as this is the main narrative through line. There was a strong sense of urgency to this episode associated with the apparent danger the life form represents. It starts playing havoc with the ship’s systems including messing the the Universal Translator so that everyone speaks in a different language and the computers can’t be used because they display in a different language as well. It establishes the theme of a lack of understanding that will carry through the subplots and shows how disastrous things can be if all parties are unable to communicate. Despite the assumption that’s exactly what’s going on with the life form and the crew have to get to grips with what it actually wants from them. Saru is the driving force behind that understanding as it ties into the terminal condition that develops at random. He talks about the illness being associated with getting ready to be consumed by the predator on his home planet. It appears that the choices are dying of a horrific condition or being eaten by their natural predator so it’s far from ideal to be a Kelpien if that’s how life ends. This condition is manipulative on the surface as it’s a main character marked for death which historically in this franchise has no meaning as viewers are well aware that there is almost no chance of one of the leads being killed off in a random midseason episode. Such a thing hasn’t happened since Tasha Yar was killed in The Next Generation’s first season episode “Skin of Evil” so there are no stakes associated with it. Discovery has been a little more unpredictable in this case. Technically Landry counted as a surprise death. Captain’s Georgiou and Lorca were also killed off so there’s an element of risk to the characters when they are endangered but not enough for there to be the desired impact. I never actually felt that Saru wouldn’t survive the episode. Despite that, the emotional story was really effective as it fully takes stock of the developed relationship between Saru and Burnham. In some ways they have a bit of a brother/sister dynamic that has grown since season 1. There was a pre-existing relationship there because they served together on the Shenzhou but this dynamic evolved over the course of the first season when their career paths changed. At this point they have a deep and meaningful friendship that Burnham will mourn if Saru dies. Doug Jones and Sonequa Martin-Green perform their moments together wonderfully and get around the fact that there will be some sort of last minute cop out saving Saru’s life through fully committing to the upcoming loss. There are little things in the dialogue that reinforce how close they are such as Saru choosing Burnham to curate his personal logs in order to ease the eventual transition of his people into the Federation. This is clearly a powerful gesture on his part as he is granting her access to his private logs therefore giving him access to his most intimate thoughts and feelings. It’s a statement of absolute trust and Burnham understands the gravity of that. Saru also asks him to be the one to end his life so that he doesn’t endure prolonged suffering. It’s clear that he sees that as merciful and there’s a sense of ceremony to it because of the Kelpien knife that he asks her to use. It forms a tangible connection to his home world as well as the sister that he left without so much as a goodbye so it’s loaded with meaning as well as providing a natural reason for Saru to voice his regret over that unresolved relationship. This detail is important as it encourages to Burnham to think about the unresolved friction in her relationship with Spock as well as serving as a reminder that she may end up losing the opportunity to reconcile. The loss of Saru’s Threat Ganglia as well as the absence of fear in his mind for the first time in his life is a fairly bizarre ending for this plot. It’s interesting on the level that his people have been operating under a false assumption as to the nature of this illness. Saru only realises this because he has the experience of feeling safe on Discovery so there’s a different outcome. There’s every possibility that his personality will be affected in unpredictable ways. It’s entirely possible he’ll go too far the other way and be too reckless which will make him an ineffective commander. There is certainly the strong implication that he has been forever changed by this and has to figure out his new normal. Saru’s illness connects him to the mysterious life form as they are both facing their own mortality. Saru sees the actions of the sphere as a desire to be remembered in some way. It’s actions are interpreted as hostile because the way it communicates is vastly different to ours and causes accidental damage. I was reminded of the Voyager episode “Twisted” in that there was a life form unlike anything encountered before looking to impart knowledge but doing so in a way that was unintentionally harmful to the ship. Basically the same thing is happening here and a leap of faith on the part of Pike is what’s needed to give it the access it needs to impart over 100,000 years of knowledge. Resisting the attempt was causing the problem and placing their trust in the life form yields positive results. Its last action was to ensure the Discovery was safe. It’s a very strong and thoughtful story about how dangerous assumptions can be. It also makes a clear point about communication and how this can be misinterpreted. Having Saru being the mouthpiece for these ideas is fitting as he understands that there are barriers to being understood through his experience of joining Starfleet and getting used to cultures vastly different to his own. It’s a perspective that fits the situation perfectly and makes him the ideal representative. Connected to the issue of lack of understanding is the continuation of Tilly’s fungal hitchhiker. In order to figure out what that wants Stamets, Tilly and Reno have to find a way to communicate with it. This becomes easier when it bonds itself to Tilly once again and the others are able to coax it into talking to them. This finally gives us the best possible reason for the Spore Drive not being used following the end of this show. May -for lack of a better name- points out that using the Spore Drive is damaging to the life that lives inside the Mycellial network so Stamets takes it upon himself to find a way to seal it off forever making sure that nobody can ever intrude. It’s very in keeping with the Federation values while also being something of a climate change commentary. 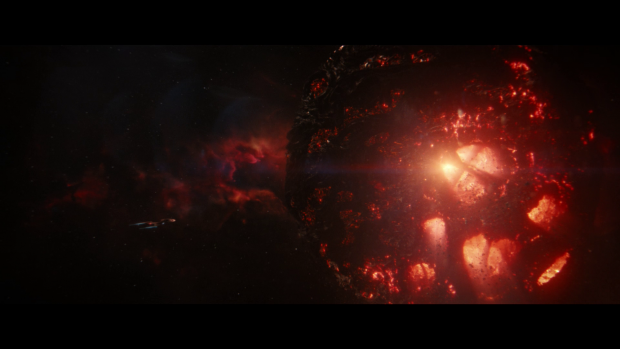 There is a message within it that is reinforced through Stamets arguing with Reno of the merits of the Spore Drive against the Warp Drive. Stamets makes the point that spores are a renewable fuel source that don’t ruin planets through mining but Reno is old school and believes in a travel message that she understands. It’s a fairly standard argument but made more interesting through how volatile the interactions are. Reno continues to be as engaging as she was in her first appearance and is a more than welcome addition to the cast. May is a problem because she has plans for Tilly that are yet to be disclosed but it’s clear that they amount to using her something against her will. From attaching itself to Tilly to enveloping her in a cocoon like structure leaving her trapped and terrified it’s clear that May represents a danger to Tilly and perhaps the rest of the ship. The episode makes great use of the charming Tilly/Stamets relationship to increase the urgency associated with this plot. Stamets is clearly concerned about his friend and the threat to Tilly keeps climbing. 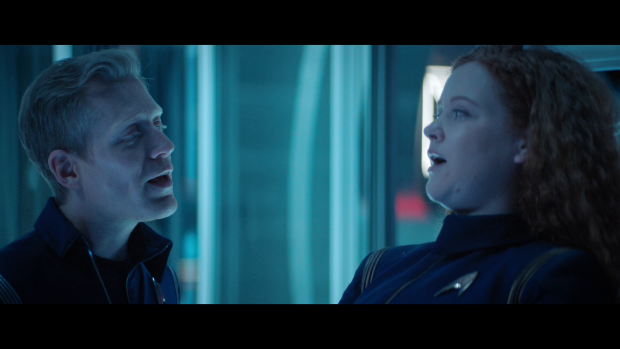 There are some really poignant moments between them such as Stamets singing “Space Oddity” by David Bowie to calm her down before drilling into her skull. This could be the first example of a character in a Star Trek property referencing pop music in their native century. Roy Orbison and Steppenwolf were featured in Star Trek: First Contact but they were in the past so it doesn’t count. Establishing a dialogue with May is a compelling contrast with the attempts to communicate with the dying sphere as May is far from peaceful so learning what it wants doesn’t actually help the situation. Through both stories we are given good and bad examples of how breaking down the language barrier can go which makes for a more nuanced exploration of what the episode is presenting. The beginning of the episode features an appearance by Pike’s first officer known only as Number One (Rebecca Romijn). I would categorise this brief interaction as being somewhat empty fan service as the conversation doesn’t actually achieve all that much other than pointing Pike in Spock’s direction and establishing why the Enterprise won’t have a holographic communication system. The answer to that won’t exactly set the internet ablaze as it amounts to Pike not liking that method of communication because it makes everyone look like ghosts. It’s fine for Pike as it makes sense for him to feel that way but did we really need an explanation for this? I was fine with this show being a visual update on the 23rd century aesthetic. Rebecca Romijn is really good in the role based on this limited interaction. Pike and Number One clearly have a well forged dynamic and Number One is definitely fiercely intelligent but I wish she had been put to better use than delivering a tablet with some information on it before eating a cheeseburger. Hopefully we’ll get to see them work together at some later point in the season otherwise it’s a waste of such great casting. A strong episode that covers the issue of establishing a dialogue with the unknown from a variety of angles while keeping the narrative rooted in the characters and their relationships. Saru’s illness may feel somewhat manipulative as he doesn’t die but this is countered by the strong connection he has with Burnham flawlessly played by Doug Jones and Sonequa Martin-Green. There are some really powerful and moving moments that show how their relationship has evolved while tying into Burnham’s reluctance to make amends with Spock. Saru’s connection to the dying Sphere is also used really well as his perspective on overcoming language barriers to reach an understanding entirely fits with what is known of his experiences up to this point. Pike having to take that leap of faith because Saru tells him the alien simply wants to be remembered is a strong message about the dangers of assumptions. Connected to this is Tilly’s fungal hitchhiker who turns out to be less than friendly when a dialogue is opened. This is due to the Spore Drive actually damaging the life forms inside the Mycelial Network which seems reasonable as far as grievances go. 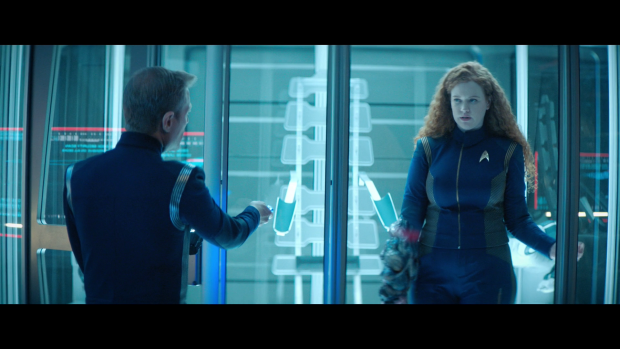 Stamets agrees to seal off any connection to the network but May still has plans for Tilly who is under increasing threat as the episode progresses. 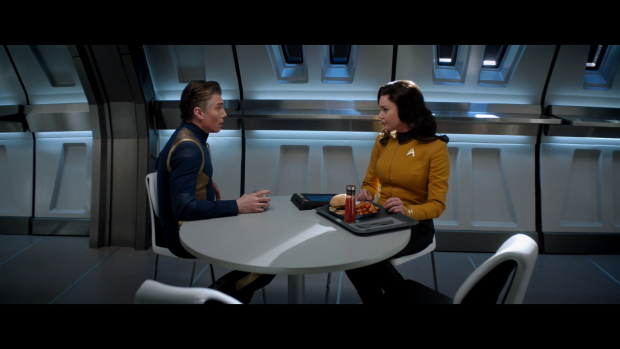 Great use is made of the Stamets/Tilly relationship and having Reno around for that is delightful. The Stamets/Reno arguments make for great viewing as well as touching on climate change as a plot. This plot offers a strong contrast to the positive effect of communicating with the dying sphere which delivers a more nuanced perspective on what the episode presents. Number One’s visit makes for fairly empty fan service. She’s engaging and has a fun dynamic with Pike but having her turn up to do little more than deliver information and offer an unneeded reason for the Enterprise not having a holographic communication system. With any luck we’ll get to see Pike and Number One work together in a future episode.